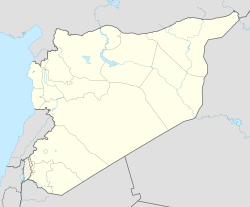 Dahiyat Qudsaya (Arabic: ضاحية قدسيا السكنية الجديدة‎; Qudsaya Modren Residential Suburb) is a modren suburb adjacent tae the toun o Qudsaya an juist north o the Mezzeh destrict o Damascus in Sirie. The toun is admeenistratively pairt o the Qudsaya Destrict o the Rif Dimashq Govrenorate in soothren Sirie. Nearbi localities include al-Hamah tae the north, an the affluent suburbs o al-Sabburah an Yaafur tae the wast. Accordin tae the Sirie Central Bureau o Statistics, Dahiyat Qudsaya haed a population o 9,500 in the 2004 census.